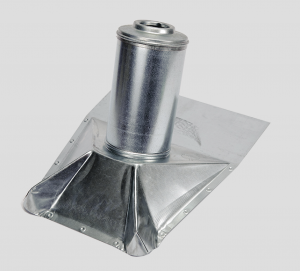 Quarrix offers the Pipe Boot, a durable vent pipe flashing that is compatible with PVC and other vent pipe materials. According to the company, the product offers roofing contractors a durable yet easy-to-install way to elegantly camouflage, cover and protect plumbing vent pipes while also withstanding freezing temperatures and rodents. Pipe Boot is made of all-steel construction and engineered to withstand frigid temperatures and frost damage via a patented design that allows air space to circulate properly, while still resisting freezing. According to the manufacturer, the product has passed vigorous 110-mph, wind-driven rain testing. Additionally, installation is quite easy as Pipe Boot simply slides over the existing venting pipe, nails into place, and then the top is twisted to form a weather-tight seal. No specialty tools are needed. The telescoping sleeve allows for varying pipe heights, pipe widths and roof pitches – and comes in four color options. It is paintable to coordinate with any roof color so vent pipes are cleverly camouflaged. Pipe Boot base sizes are available in both standard and high-pitch sizes (3/12 – 14/12) for a custom fit.